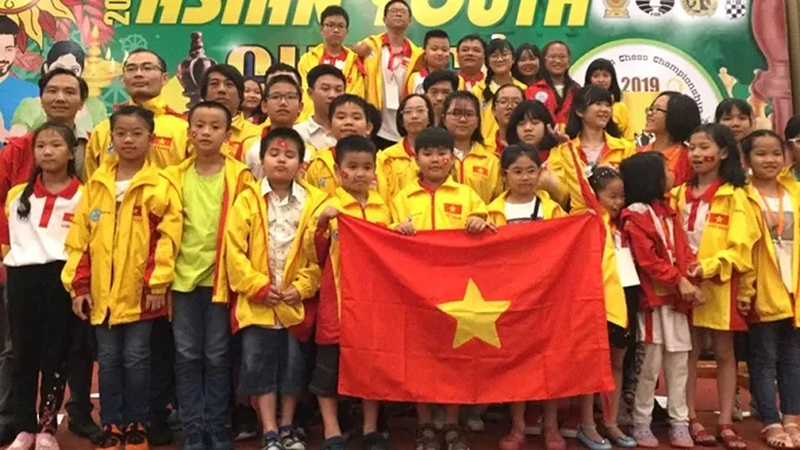 Vietnam’s junior chess stars produced a successful end to their campaign at the 2019 Asian Youth Championship in Kaluthara, Sri Lanka, winning a total of eight gold, 12 silver and seven bronze medals. The standard chess category saw the Vietnamese players dominate, as they claimed three golds, four silvers and two bronzes. The title winners included Bach Ngoc Thuy Duong (girls U16), Nguyen Hong Anh (girls U18) and Tong Thai Hoang An (boys U10). Vietnamese players at the closing ceremony. Earlier, Vietnam clinched two gold, five silver and two bronze medals in the blitz chess event (second place), in addition to three medals of each colour in the rapid chess division (second place). The gold medalists included Tran Dang Minh Quang (boys U14, blitz gold), Ho Ngoc Vy (girls U10, blitz gold), Pham Tran Gia Phuc (boys U10, rapid gold), Nguyen Quoc Hy (boys U14, rapid gold) and Nguyen Hong Anh (girls U18, rapid gold). 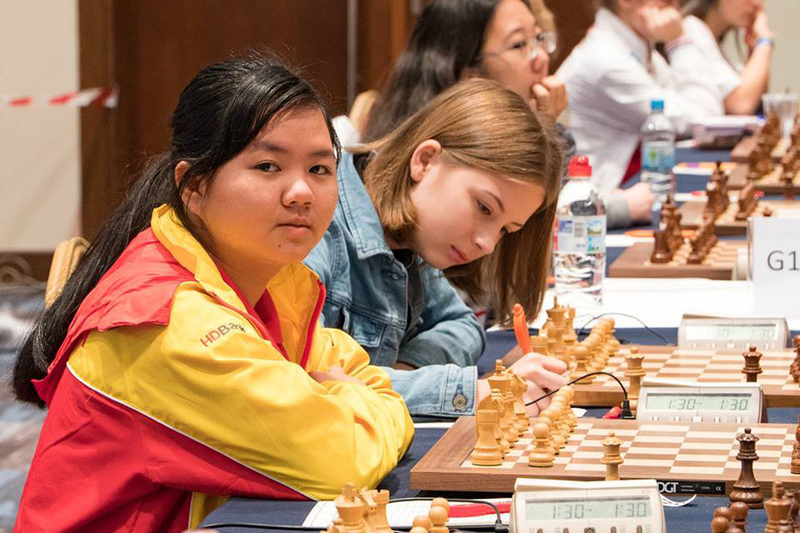 Among the aforementioned gold medal winners, Bach Ngoc Thuy Duong, who joined seniors in the national team to finish 15th at the 2018 Chess Olympiad, was the most outstanding name. Duong came second in the race for the Nino title in honour of the best player of the tournament in Sri Lanka. The 2003-born girl has become well-known since she claimed the U16 rapid chess title at the FIDE World Youth Rapid & Blitz Chess Championships 2018 in Greece. Vietnam's Bach Ngoc Thuy Duong wins one gold and two silver medals in the girls U16 category. By winning eight golds in total, the Vietnamese contingent defended their overall runner-up finish at the Asian Youth Championship arena, two golds behind the leaders Kazakhstan. The 2019 tournament took place in Kaluthara, Sri Lanka, from April 1 to 10, with Vietnam represented by 35 players. In last year’s event, Vietnam won a total of seven gold, 23 silver and 13 bronze medals, finishing in second place overall behind India. Vietnam’s No. 1 chess player, Le Quang Liem, came out in third place overall with five points at the 2019 Spring Chess Classic in St Louis, Missouri, USA, after brilliantly finishing off Ukrainian master Vassily Ivanchuk in the last round on March 10. Vietnam’s top chess player Le Quang Liem continued his progress by beating Grandmaster Rustam Kasimdzhanov from Uzbekistan in the fourth round of the ongoing Spring Chess Classic on March 5 in Saint Louis, Missouri, the US. More than 300 players from 27 countries and territories worldwide will compete at the ninth HDBankCup International Chess Tournament slated for March 7-13 in Ho Chi Minh City. Vietnam won the Asian Youth Xiangqi (Chinese chess) Championship Vietnam Open, with 17 out of the 30 gold medals.